We’ve been using the Linksys SPA942 handsets for a while and they have worked very well for us. One of the major annoyances for us and others is the inability to populate the personal directory automatically. I’ve read a number of posts on how to use wget to issue to personal directory to the phone via a HTTP post and this seemed like a good solution. In particular this post and this post inspired me to see if I could create a solution using the same technique in VB.Net. So I have put together a simple program which will allow you to load/save a personal directory to/from a tab delimited file or handset. There are loads of enhancements that could be made in order to make the application more sophisticated but this is really a first attempt, so please report any problems. You will need .net framework 3.0 to run the tool. I’ll put the project into a proper setup file if it is sufficiently popular. I’m using firmware version 6.1.5a, I’d be interested to hear if this does/does not work on other versions or if anyone has any suggestions for enhancements. 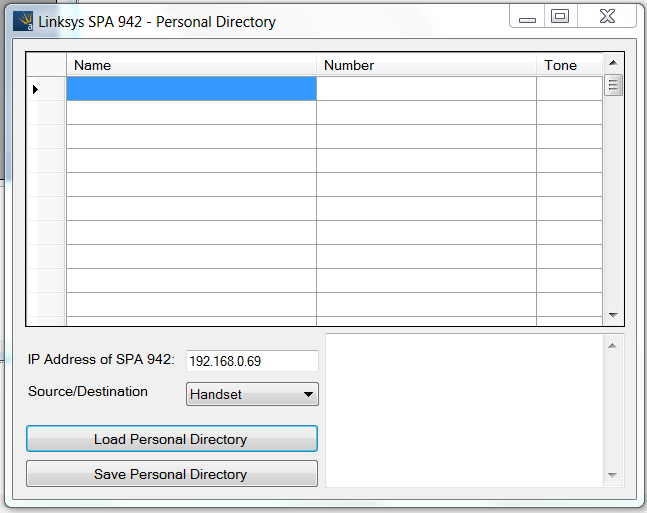 This is also a great way to backup/restore your Linksys SPA handset – I factory reset my handset and this much easier than re-entering all the personal directory. I am using this with my SPA941 firmware version 5.1.8 without any issues. Do you have any special characters in your personal directory entries? I suspect it is one particular entry causing a problem, how many do you have? That was it – I was using an ampersand ‘&’ in the name field. Replace it with ‘and’ – and all is well! Thank you very much – both for the quick help and the original code – makes life much more pleasant! Thanks, I will add some code soon which encodes the special characters, so hopefully this won’t be a problem. I’ve used this with the spa962 and spa941. I was looking for a program like this. Only thing you can’t delete an entry, only overwrite it with another name and phone number. But that is only a little detail. This is the program I was looking for. I tested it on a SPA942 with firmware 6.1.5a and it worked fine. – if you plan to develop this tool further I would be happy with a way to push it to multiple phones. i.e. we have 30 phones and now I have to do each phone manually. If I could give some kind of starting IP range and end IP range it would be great. OPnce again, very nice tool! If you don’t want to develop it any further maybe there is a chance you share the code so we can do it ourselves. Hi I like to agree with Jamie that it would be great to push the Directory to more than one Telephone. I take a look to your binary at my small private lab with an SPA941 with 5.1.8 without any Problems. The GUI did not scale and normaly did not show all three fields at one time. Great Tool very useful to back up all the different personal directories people have. I am using 942s with 6.1.5a and 5.1.15(a) and it works with both and is really useful as I need to upgrade all the phones to 6.1.5a and the easiest way is through TFTP but it only seems t work if the phone is Factory reset first ths deleting the directory. As others have said it would be great to provision more than 1 phone at a time and also if you load a directory with 30 items and then another phone with 10 entries it replaces the 10 but keeps the “extra” 20 from the previous phone. 2) create a proper setup file for this… trust me.. will be very popular! it would be great to provision more than 1 phone at a time and also if you load a directory with 30 items and then another phone with 10 entries it replaces the 10 but keeps the “extra” 20 from the previous phone. I have just uploaded an improved version and will look to make more regular updates from now on. I have also resized the application, although it is still not scaleable you should be able to see a lot more than you did before. I know everyone wants a way to push the directory to multiple phones at the same time. I have a version that does this, just need to do a little bit more testing. Thank you very much for this excellent tool! It has just made managing the directories on our Linksys phones MUCH easier. Hello, i am very curious to try out the version for multiple phones, could you send me the file, or a link from where i can download the file. This is fantastic. from vista sp1 *shiver* to spa942 firmware 5.1.15(a). This has saved us considerable time and resource. Do you take donations? Not right now, but I do take compliments. Thank you for your kind sentiment. Thanks for this. It has helped me a lot. How’s the progress on your version that pushes directories to multiple phones? I am very interested in that one and can’t wait for you to make it available for download. Tried this tool on one of the new Cisco SPA500 Series, and i can read (download) the directory from the phone, but when i try to upload to the phone, i always get an error (error 400 – I think it means something was not found). My guess is the SPA500 has some differences on the web interface that cause this. I guess that the web interface on the telephone is different. I could modify the code to suit, but I’d need a 500 Series in order to play around with it – I don’t have one so it is probably not going to get fixed. Sorry. This is an awesome utility which works very well and takes some time to figure out how to use correctly. in our office set-up, we had to leave a blank line in the tab delimited file and then enter the info afterwards and assign ring tones for various contacts. Problem we not have, is the office expanded and we bought spa942 replacement which is the Cisco 504g and the util does work as it reports that it cant find the device. Would be great if the util can be updated to support the newer ip handsets available. is 100 the limit of contacts? how can i add more? You cannot add more, 100 is the maximum that the SPA phones take as far as I know. I set the same limit in the application. Is there a possibility for automatic dialing over TCP ? I’ve always wanted to add a calling feature, but I cannot find anyway to make the SPA do this via HTTP, or indeed any other method, so if you find a way that works, I would gladly update the application to support this. But I do not think that there is a way. Cool I like it. Works with SPA962 and SPA942. Works well with SPA921 as well. Thank you. Will “save from”, but not “load to” SPA504G 1st generation after they re-branded/re-named this from the SPA942. Verified to not work with hardware version 1.0.2(0001), using stock firmware (7.4.3a) or latest firmware (7.4.9a). Is there any way to fix it ? Thanks for your help! How many IP phones can I manage by one license? From what I understand, this isn’t the way – and there isn’t away to change the directory.